The Raimundtheater theatre is a historicist theatre in Vienna′s sixth district of Mariahilf, in walking distance of the Westbahnhof. In Austria, it is mostly known as a stage for musical productions and if you walk by it on pretty much any evening, you will find dozens of busses from all over Austria that prove this. Musicals happen to be very popular with people who usually wouldn′t necessarily go to the theatre; if they come in organised groups with a bus, it is a big advantage to aim for an accessible place such as the Raimundtheater, which is just off the Gürtel Road. The Raimundtheater was named after Ferdinand Raimund, a popular playwright that produced lots of folk plays of the genre "Wiener Volkstheater". 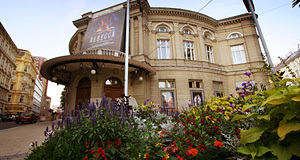 From the beginning, the Raimndtheater targeted the taste of common people: It was built by a society of Viennese burghers and opened in 1893 with Raimund′s "Die gefesselte Fantasie". Whilst the Wiener Volkstheater can be seen as somewhat trivial, it certainly makes the Raimundtheater my preferred venue for musicals alongside with the Ronacher in the first district. The first directors Adam Müller-Guttenbrunn and Hermann Bahr, however, did have artistic ambitions. They tried to make the Raimundtheater a place for "serious" folk drama on contrast to the operetta stages, that boomed among the aristocracy of Vienna at this time. So in this context, it is worth noting that the Wiener Volkstheater and its legacy wasn′t seen as the peak of triviality at all. Many political and social references of the Volkstheater are not fully understood anymore, which is why today′s productions are often reduced to the entertainment aspects. However, the signs of the time pointed towards operetta, which the Viennese loved dearly and still do. After 1908, the Raimundtheater became with short interruptions a popular operetta stage with productions of the worst kind with such composers as Johann Strauß and Robert Stolz. After WWII, this tradition continued with super-stars of German-speaking showbusiness such as Johannes Heesters, Marika Rökk or Zarah Leander. Many of these artists also featured in operetta movies (a genre remarkably similar to Bollywood movies in many ways, and popular at a time when Austria was economically similar to India), TV productions and with concerts. In 1976, the Raimundtheater started to occasionally show first musical performances. In 1984, the theatre was refurbished extensively. Since 1987, it belongs to a company that in turn belongs to the city of Vienna, the "Vereinigte Bühnen Wien" ("United Stages Vienna"). This company runs the Raimundtheater, the Ronacher and the Theater an der Wien. Since then, the Raimundtheater produces almost exclusively musicals and occasionally operettas in a "stationary system", meaning that similar to many musical stages, a production is done with more than one ensemble for several months or even years. Attractions nearby are as good as non-existant; the city′s library is not far, nor are Westbahnhof and Stadthalle; and the Mariahilferstraße is Vienna′s most popular shopping lane. Otherwise, I would recommend to hop on the subway and do go to a more central area for sightseeing or even dinner after the show.